Summer is here and that means a myriad of songs are brought to us each day by nature here at the Inn on Mill Creek B&B inside Pisgah National Forest: bullfrogs, crickets and of course, birds, to name a few. And you know if something has “song” in its name, you can count on it being part of nature’s summer live concert series. 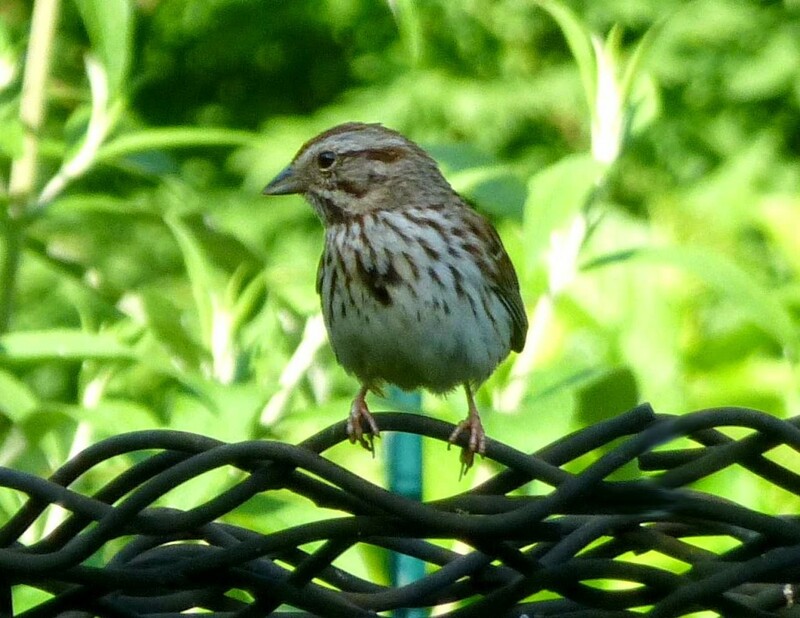 Thus, we’ve given the Song Sparrow our June entry in our 12 Months of Birding at the Inn series on the blog for 2014. Song Sparrows can be found in most parts of the United States at some time during the year, in winter, summer, or all year long. In our neck of the woods near Asheville, North Carolina, Song Sparrows are year-round residents. And the way they look varies by region: according to the Cornell Lab of Ornithology, there are 24 subspecies of Song Sparrows in 52 forms, making them one of the most regionally variable birds on the continent. Generally, Song Sparrows are brown birds with lots of streaks, and the streaks on their heads can be reddish brown and grayish brown. They often have a dark spot on their white chests. Song Sparrows also have short beaks and long tails. when traveling may not sound quite like those from your hometown. 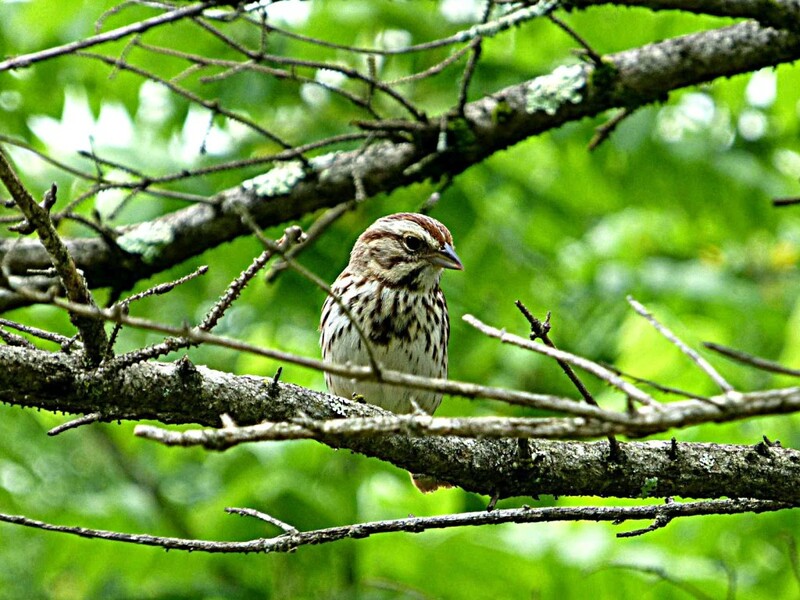 In addition, the Song Sparrow will sound the alarm when it thinks a predator is approaching its nest, with a loud, sharp chip note. 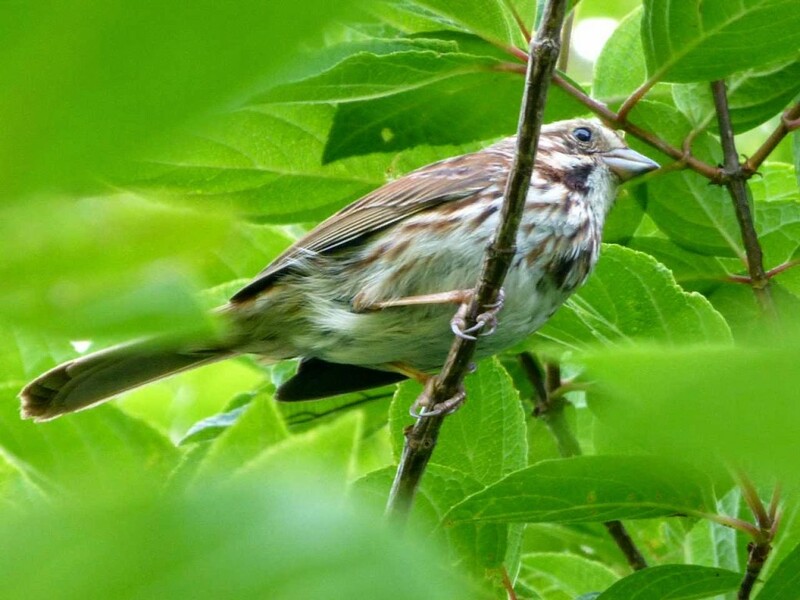 Song Sparrows are not shy birds, and you will often see them on the low branches of our peegee hydrangea, on the tall boxwoods next to the Pool Garden and on shrubs in the Pool Garden, and at the bird feeders. This makes them excellent photography subjects! To learn more about our North Carolina mountain birds, check us out on the North Carolina Birding Trail. This entry was posted in Uncategorized and tagged 12 Months of Birding at the Inn, Asheville, birding, Black Mountain, Old Fort / Andrews Geyser by Inn on Mill Creek. Bookmark the permalink.